So how many books does an author get to write before editors ignore their work and just put it out there? Obviously, James Patterson hit that number a long time ago. I have read all of the Alex Cross books. I used to read the Women’s Murder Club books until they became writing by formula. I refuse to read the books co-authored by him after the first one, they are terrible. Now I ask myself, am I going to give up on Alex Cross? 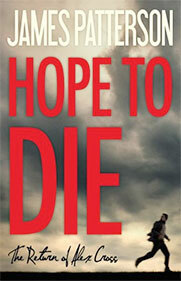 Hope to Die is the continuation of Cross My Heart, which was atrocious. There are so many holes in this story that it should have been called, No Hope, Dead. Besides the flaws in police procedure, the under-played reaction of Cross to his situation and the total predictability of the story, there are too many facts that are just wrong. An example, Patterson describes Cross as “six feet two inches with a thirty inch reach”. I am only five feet eleven inches and I have a thirty five inch reach without stepping up on my toes. So as not to reveal anything that might spoil the book for anyone who has not read it, I am going to stick to the flaws in the editing that make this a terrible read. Patterson begins one chapter by describing “three birches that grew close together”. Hello, that is how birches are, planted three together, which everyone already knows. In that same chapter he says, “the dog went to the stove and lay down by the stove”. I didn’t think he went to the stove and lay down by the TV! In one chapter he tells us the alias used by the antagonist has shown up seven times in a internet search, a few chapters later he tells us this again. The worst part of bad writing/non-editing is the chapter dealing with Alex Cross having to kill someone at the direction of Marcus Sunday (the antagonist). This chapter is written in first person so we are in Alex’s head. Okay so maybe I need to say spoiler alert here. We know and Alex knows that his killing is an act, but the thoughts in his head are portrayed as if they are. NO! Alex would not be having the emotions and physical response Patterson gives us knowing he is faking a killing. If all of this were not bad enough, the ending is lame. For two books we have had a methodical, diabolical killer who is meticulous in his planning. He would not have put himself in the situation that he does to end this story. James Patterson is a prolific writer and he used to be a good one. It is sad to see that all change. This one gets one star. This entry was posted in Fiction - James Patterson by Don Grant. Bookmark the permalink. I THROUGHLY AGREE with everything this critic has said! I have said as much in a couple of blogs & OMG did I get dished by idiots who still think JP is beyond criticism!!! I’m all for a spoiler alert on my end. I’ve been reading all of these books, now on hope to die and it’s really starting to piss me off. Based on the other Alex Cross books, I am going to assume that everyone in his family is alive and this is some way to get him to start killing. I just don’t know if I have the patience. Please tell me how this ends???? Been a while since I read this. But his family survives. Sad that Patterson lost his writing edge.